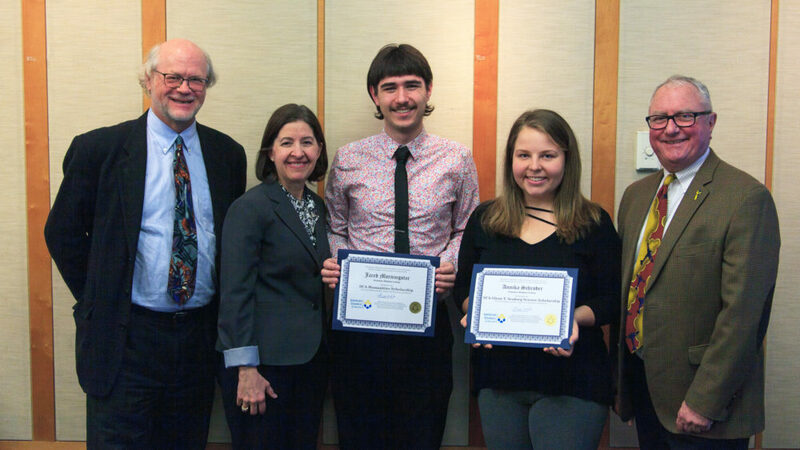 Schroder (second from right) was awarded the Swedish Council of America's Glenn T. Seaborg Award at a reception with SCA Board Member John Hasselberg, Gustavus President Rebecca M. Bergman, fellow award winner Jared Morningstar, and SCA President Gregg White. All the way from her home Puerto Rico, Gustavus Adolphus College junior Annika Schroder has been named the 2018 winner of the Glenn T. Seaborg Science Award by the Swedish Council of America (SCA). The award is given annually to an outstanding science or mathematics student from one of six U.S. colleges with Scandinavian heritage that maintain an active connection with modern Scandinavia through language study, student exchange programs, and cultural events. The award will allow Schroder to travel to Sweden in December and attend the Stockholm International Youth Science Seminar as well as several events during Nobel Prize Week including the Nobel Reception and the Nobel Prize Award Ceremony. 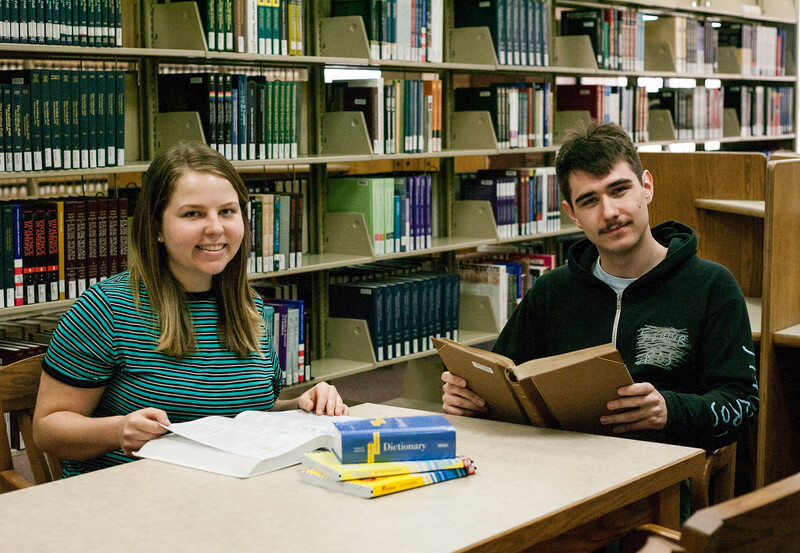 Schroder (left) and fellow Swedish Council of America award winner Jared Morningstar study in the Gustavus library. After graduation, Schroder plans to work towards an MD/PhD and eventually become a specialized OB/GYN studying embryology. “I’m excited to figure things out, get more research experience (possibly in Sweden), and work towards all of my goals, one at a time,” she said. “Annika raises the level of any discussion she is part of, and she does so with humility and perpetual curiosity. It’s a joy to serve as her academic adviser, and in some ways I think I’ve learned as much from her as she has from me,” Lindqvist added. Visit the Gustavus website for more information about the Gustavus Scandinavian Studies department and about the support the Gustavus Fellowships Office gives to students in securing national awards, scholarships, and fellowships. Anikka was my student in 6th grade & during the high school years she was part of my Science Bowl. As an educator, I’m very proud of her & this accomplishment. I wish her luck in pursuing her goals. Always dedicated with a thirst for knowledge.